with the help of our custom design experts. Have it your way in 2 weeks! Believe in the finest! Here at 25karats.com we always live by that motto. And our extensive collection of Wedding Bands is not an exception. We offer only the finest designs, whether they are as simple as a plain wedding ring, or as striking as an eternity wedding band. We use only the highest quality metals and diamonds for your order! 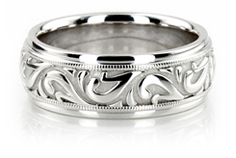 All wedding bands we carry are solid, you will never get any hollow or plated product from us. 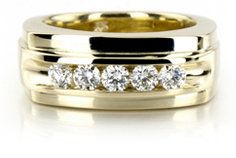 Our wedding rings are available in 14K and 18K Gold, as well as Platinum 950 and Palladium 950. Our diamonds are GH in color and SI1 in clarity. All wedding bands on our store are manufactured for you in New York, USA. That’s how we can provide your specific band with such speed and unmatched quality. We have our own manufacturing shop for non-diamond bands, and all diamond bands are set and finished by the expert manufacturers on 47 Diamond District, the heart of jewelry business in NY. At 25karats.com, we strive to offer you the best Customer Service experience. Our professional Wedding band experts will help you choose the band you always dreamed of. And our easy-to-navigate website will help you browse our wide selection of wedding bands without hassle. With our customer-friendly categorizations and filters, you will find all the bands in the style and dimensions you have in mind, fast and easy! 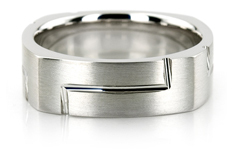 All of our wedding bands are made to order, for the specifications you need! When you purchase a wedding ring from 25karats.com, you will have the peace of mind of buying a brand new band manufactured just for you, not a stock ring altered to match the order. With our free engraving offer, you can also have words with a special meaning for you and your loved one inscribed inside your precious wedding bands, and create a timeless token of affection.